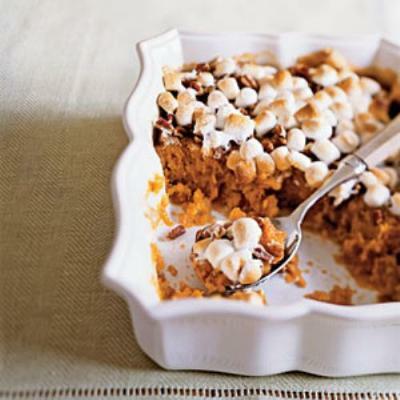 This sweet potato recipe makes the perfect addition to your Thanksgiving table. Kids will eat it up! Place potatoes in a large bowl. Add sugar, butter, salt and vanilla. Mash sweet potato mixture with a potato masher. Scrape potato mixture into an even layer in a baking dish coated with cooking spray. Sprinkle with pecans and marshmallows. Bake at 375° F for 25 minutes or until golden. Serves 8.